"The Package" combines bike purchase with a four day ride series including free Elite Services for the best bike, guide, food, comfy transport and range of exotic singletrack rides anywhere. MOOTS remains our best selling line for our bike purchase package deals, but for the 2013 and 2014 seasons we are providing a very special opportunity to own a Dreamride POE, a very advanced, state-of-the-art, extremely light and innovative titanium 29er or 650B hardball designed and built for Moab's assortment of roads and singletracks. Because the POE is fabricated to our specifications, it offers amazing details, features and parts selections specifically formulated for the individual client. The Moab Singletrack Combo (MSC) is a special combo that includes our in-house designed and outfitted Dreamride POE titanium 29 and 27.5 inch wheeled mountain bikes in combination with a four day, six night, Moab Singletrack Vacation. Rides are chosen to heighten the abilities of the POE, which was designed to be light, fast and sturdy, and to be ridden from town when possible. It's big wheels roll fast over obstacles and debris. The POE is extremely light weight with a frame weight of three pounds. A complete POE can weigh as little as 22 pounds. Click on DREAMRIDE POE and visit the POE ON FACEBOOK for video and pictures. The POE puts over a half century of riding, wrenching, product testing, R&D, guiding, racing and stunt experience into a well-engineered titanium frame and parts selection. The POE is so versatile that you will want to ride it to work, then ride it to the trails on the weekend. The FOUR DAY RIDE SERIES included in the Combo is our goldilocks offering, including a rest day in the middle that can be turned into a gentle ride, swim or hike as part of the free Elite Services Upgrade. Since we specialize in couples, the Elite Upgrade is also free to your partner, if you should choose to reserve as a couple. If you would like to experience Moab's roughest trails on a Ventana full suspension rental while you are here, rental is free if you purchased a POE. Rentals are discounted for your partner. In constant celebration of our top selling bike line we continue to offer any Moab vacation with a free Elite Service Upgrade when combined with the purchase of a custom Moots mountain, road or 29er. Break-in your new Moots or Dreamride POE on rides in the Mecca of cycling! Call 1 (888) MOAB UTAH in the states. If you are calling from foreign shores the number is 435-259-6419. Follow us on Facebook for updates and pictures of bikes and vacations. Purchase a POE titanium 29er or 650B hardtail as part of your vacation with Dreamride. 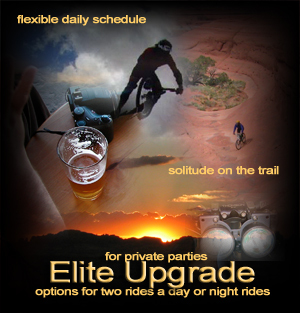 As part of this unique bicycle and vacation purchase combo, we include THE ELITE SERVICES UPGRADE and access to our full suspension rental fleet free of charge. This means your vacation is hosted and guided by company owners, food is provided before or after the daily ride (to accommodate early departures or to refresh in the comfort of our shop and guesthouse). Shuttles are extended and trail choices expanded by the wider range creative shuttles and extra drivers allow. 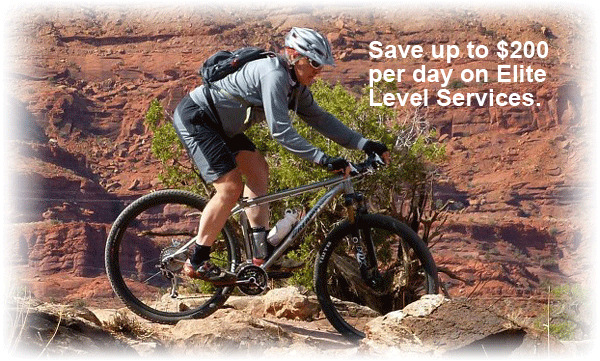 Free Elite Level services are not only extend to POE buyers who purchase a vacation, but to Moots road or mountain bike buyers, as well. Take home more than memories. The "Dreamride Moment" is a term coined by our clients to describe a feeling one gets from seeing a double rainbow through an arch, a coyote singing and following, an explosive sunrise or particularly magical section of singletrack or slickrock. These lifelong memories happen because we are in the right place at the right time. We work to time and tune the ride to the environment, each client's personal skills, fitness and interests, and current weather conditions. 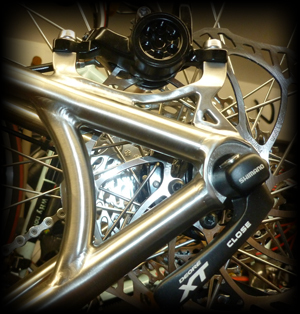 We do this daily with the same attention to detail we dedicate to fitting a fine bicycle to your body and riding style. You can have the best of both worlds: A bicycle built just for you and a Moab vacation set up just for you and your lifelong fantasies of riding a bike in the Mecca of the sport. If you are coming from across the Atlantic, we offer the free Elite Upgrade with a Dreamride vacation and a Dreamride-built POE, Moots, Pegoretti, Merckx, Pinarello or Dreamride F-69 bicycle. 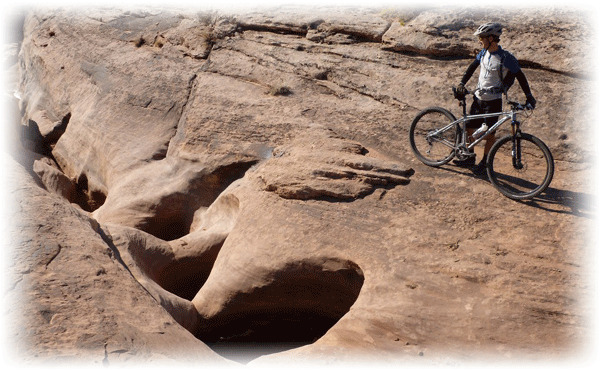 You will find the savings on the bicycle alone will pay for your vacation in Moab.